Despite 90% of the legal-sized male Dungeness crab population being taken by commercial crabbing each year, ODFW data indicate that the Dungeness crab fishery remains sustainable. Decadal variations in ocean currents along with the timing of spring upwelling conditions ultimately determine yearly adult Dungeness crab populations in the Coos estuary. Figure 2. 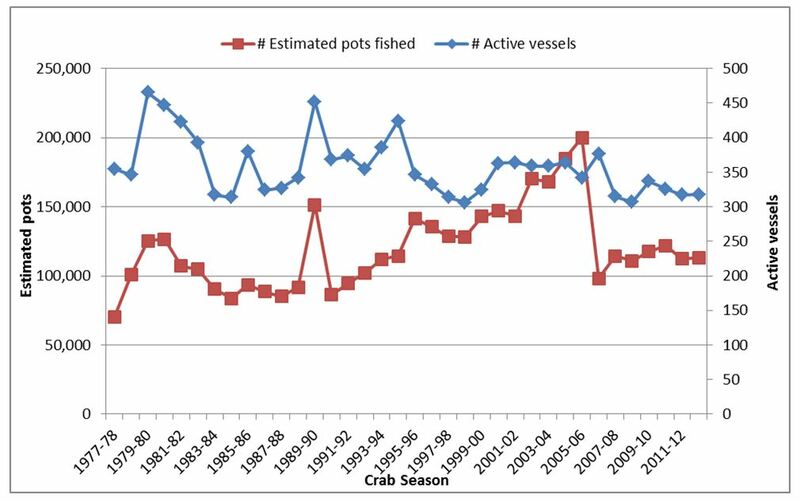 Number of active vessels and estimated number of pots used in Oregon’s commercial Dungeness crab fishery from 1977-78 to 2012-13 crab seasons. Graph ODFW 2001. Figure 1. 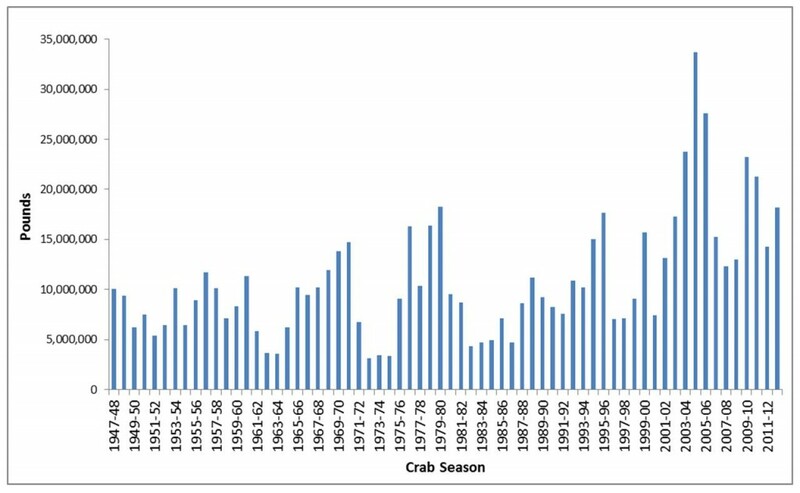 Oregon commercial Dungeness crab landings (millions of pounds) by season (1947-48 through 2012-13 crab seasons). Graph ODFW 2001. Oregon Department of Fish and Wildlife’s commercial Dungeness crab (Cancer magister) landings data provide resource managers and scientists with a very reliable index of four year old adult Dungeness crab populations in Oregon estuaries (S. Groth and A. Shanks, pers. comm., April 2012). These data indicate that the Dungeness crab fishery has been healthy and robust for decades (Figure 1) despite the fact that commercial crabbers harvest about 90% of the commercially available male Dungeness crab population most years (Ainsworth et al. 2012). We should note that some of the recent increases in commercial landings may actually be due to long-term cyclical changes in North Pacific climate, the latest cycle of which happened to benefit crab populations (A. Shanks, pers. comm., April 2012; see more in Why is it happening?). Figure 2 shows the number of commercial crab pots and vessels engaged in crabbing in Oregon between 1977 and 2012, illustrating relatively recently established crab fishery management measures. 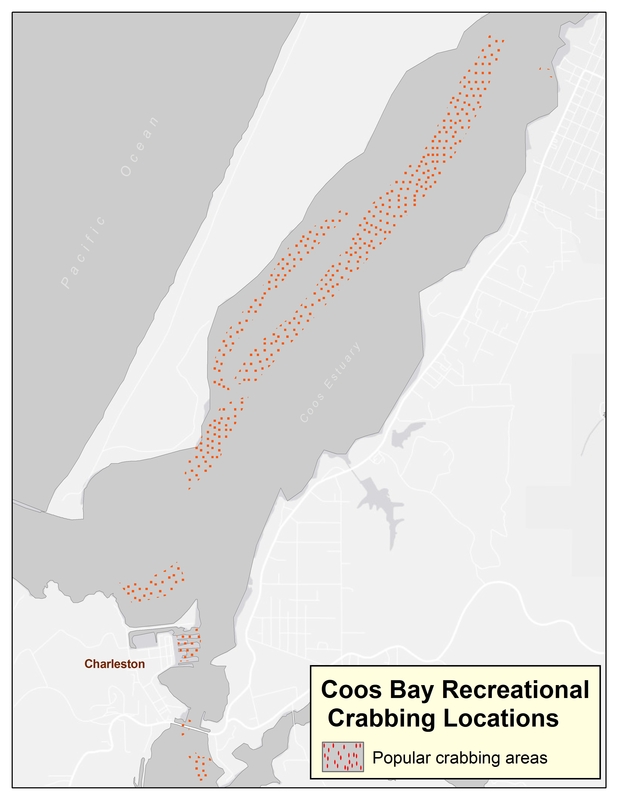 Limited entry to the fishery (limited number of permits issued) began during the 1995-96 season; limits on the number of crab pots used by permit holders began during the 2006-07 season. 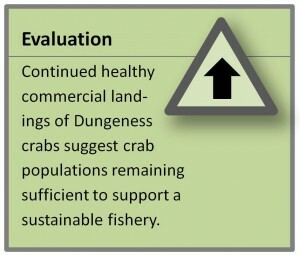 These measures help maintain the sustainability of the commercial Dungeness crab fishery. According to Ainsworth et al. (2012) in their survey of Oregon’s Dungeness crab fishery for 2007-11, crabs harvested from the Coos estuary were among the largest of all bays surveyed (likely due to the greater ocean influence in the lower Coos estuary), with a mean weight of 643.5 g (1.42 lbs) averaged over four years of data. They note that while recreational crabbing effort has not changed significantly statewide since 1971, effort has actually decreased in Coos Bay. And despite that decrease in effort, Coos Bay’s recreational crab harvests have increased. Over 40,000 crabs were caught in Coos Bay in 1971, while in more recent times (2007-2011) the recreational catch averaged between 86,000-136,000 crabs per year (likely due to improvements in fishing gear, changes in bait, and larger and more efficient boats). Current Oregon Department of Fish and Wildlife (ODFW) commercial crabbing regulations protect recreational crabbers’ share of the Dungeness crab harvest (i. e., shorter seasons and larger size limit for commercial crabbers). Without this protection, the recreational fishery would be greatly affected by the commercial crabbing industry (Ainsworth et al. 2012). Dungeness crabs inhabit estuaries and offshore waters from Alaska to Monterey Bay, California (Ricketts et al. 1985). In the Coos estuary, they’re found in the South Slough, the lower and upper Coos estuary, and the Isthmus Slough (Figure 5)(Miller et al. 1990; deRivera et al. 2005; Ramsay 2012). Like all crabs, young Dungeness crabs first live in the water column as “planktonic larvae,” first as crab zoea (2.1 mm-10 mm, 0.08 in-0.4 in) and then as pea-sized megalopae. Ultimately, they develop into small juvenile crabs, settle out of the water column, and begin living on intertidal and subtidal channel bottoms, mudflats, and in eelgrass beds. Understanding both the larval and settled life stages of juvenile Dungeness crabs helps us understand the status and trends of adult crab populations. Figure 3. Recreational Dungeness crab catch per person in Coos Bay 2008-2013. Graph: ODFW 2001. The recreational Dungeness crab fishery, another important element of the coastal Oregon economy, also appears to be stable. This is good news since according to Dean Runyan and Associates (2009), recreational shellfish harvests contribute $172 million to Oregon’s economy. The Coos estuary is one of Oregon’s most popular clamming and crabbing destinations. Recreational crabbing (mainly for Dungeness crabs) comprises a large percentage of the recreational crab harvest in Coos Bay. Figure 3 shows the relative stability of the recreational crab catch in the Coos estuary in recent years and Figure 4 shows where over 98% of the recreational crabbing effort takes place in the Coos estuary (Ainsworth et al. 2012). Figure 4. Most popular crabbing locations in the Coos estuary. Data: ODFW 2001. 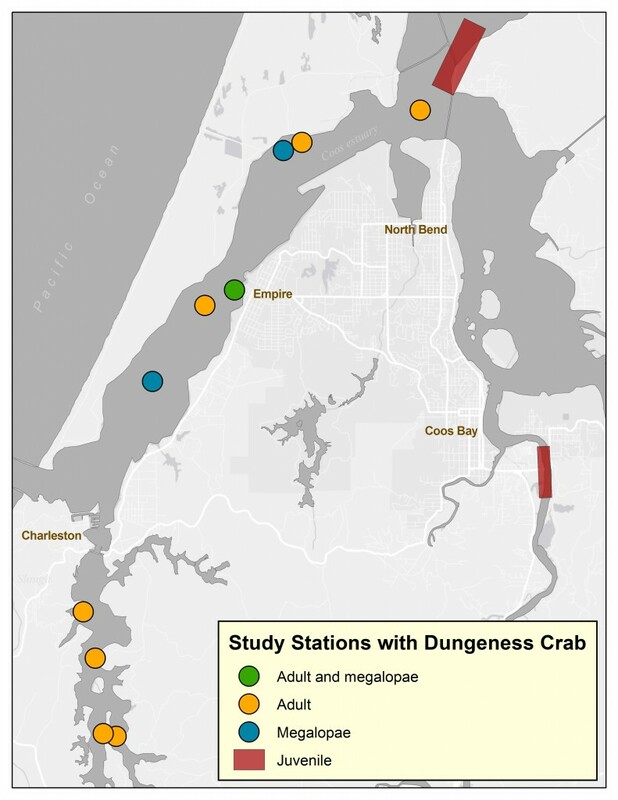 Research conducted locally by Shanks and Roegner (2007) linked the number of Dungeness crab megalopae settling in the Coos estuary with the number of adult crabs caught locally four years later (simplistically, more megalopae = more adults). Further, they determined that the number of Dungeness crab megalopae settling in the Coos estuary is correlated with the timing of the spring transition, when low productivity wintertime ocean conditions off the Oregon coast shifts to high productivity summertime ocean conditions (productivity determined by north wind-driven upwelling in the summer and south wind-driven downwelling in the winter). Shanks and Roegner report that early spring transitions result in greater the numbers of megalopae settling, and four years later, more adult crabs available for harvest. Shanks (2013) has also described planktonic Dungeness crab larvae movement relative to Pacific Decadal Oscillation (PDO) patterns: patterns in which oceanic and ocean-related climate conditions shift every 20-30 years from cold phases to warm phases and back again. A cold phase of the PDO, which our region has been experiencing locally since 1999 (NASA JPL 2000), strengthens the south-flowing California Current. This causes megalopae to accumulate along the Washington and Oregon coasts, and thus creates extraordinary high returns of megalopae to the Coos estuary and surrounding area. During a warm phase of the PDO, the opposite occurs. 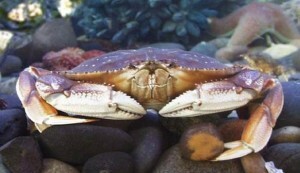 Adult Dungeness crab populations are reduced in Oregon waters as the California Current is weakened, allowing the stronger, north-flowing Gulf of Alaska Current to pick up the megalopae and move them northwards. Shanks showed that cold phase PDO, paired with early spring transition and constant spring upwelling, creates conditions for the highest crab megalopae returns to the Coos estuary system. Figure 6. Trawl stations from Armstrong et al. 2003. Map shows partitioning of the Coos estuary into Lower Side Channel, Lower Main Channel and Upper Estuary habitat types. Another study by Ramsay (2012) shows the importance of oysters as habitat refuge for juvenile Dungeness crabs. Ramsay determined juvenile Dungeness crab densities in three habitat types: native oysters, non-native oysters, and eelgrass. 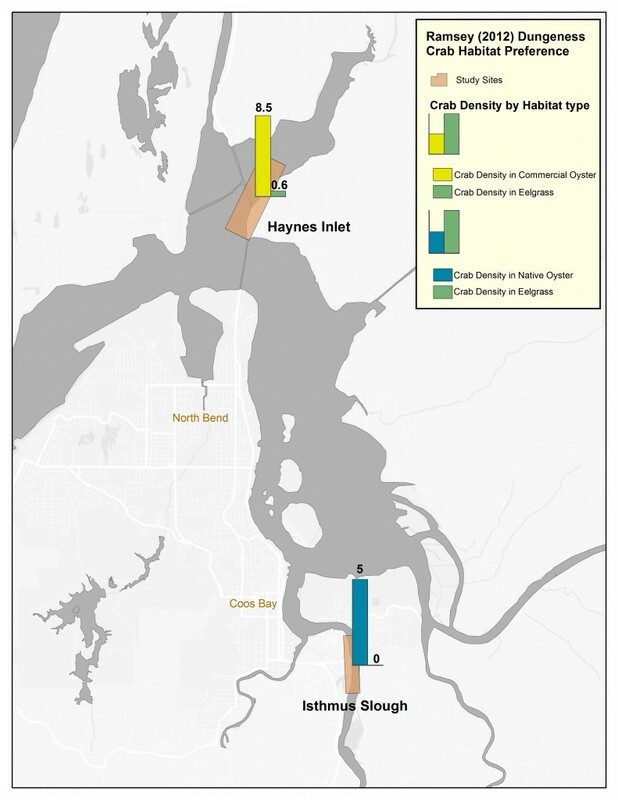 At the Isthmus Slough study site (Figure 7), juvenile crabs used native oyster habitat (5 crab/m2) far more than adjacent eelgrass habitat (0 crab/m2). 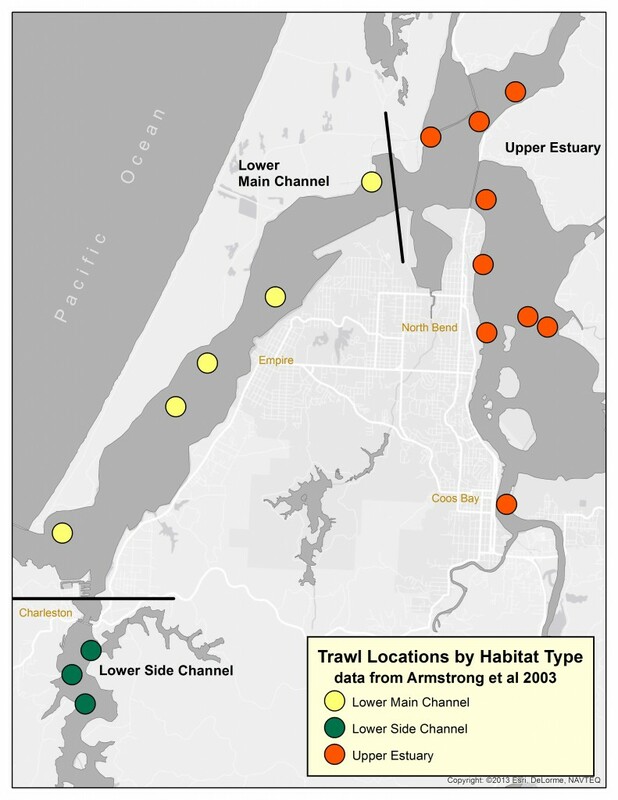 At the Haynes Inlet site, crab densities were higher in Japanese Oyster habitat (8.5 crab/m2) than in adjacent eelgrass habitat (0.57 crab/m2), though crab refuge provided by commercial oyster beds is thought to be temporary due to the frequent disturbances in those areas (S. Groth, pers. comm., 2014). Ramsay’s study did not discern a significant difference in density by oyster species. Adults also prefer specific habitats. Results from McMillan et al. (1995) found adult densities to be highest in habitats containing mixed sand and gravel along with macroalgae or eelgrass, while the lack of complexity in open sand habitats resulted in the fewest crabs. Intertidal zones are also important as they provide crucial foraging habitat for Dungeness crab adult, as seen in studies at Willapa Bay (Holsman et al. 2006). Brooding female Dungeness crabs appear to require sandy habitat (Rasmuson 2013). Due to the large number of eggs they carry under their abdominal flap, female Dungeness bury themselves in sand up to 10 cm (4 in.) deep to hold the eggs in place, limiting their movement (Rasmuson 2013). Figure 8. Study site locations from Dunn 2011, showing percentage of Dungeness crabs caught that were infected with the parasitic worm. Locations near the mouth of the estuary show higher infection rates. Figure 5. Study stations where Dungeness crabs were found during surveys . Data from deRivera et al. 2005, Ramsay 2012 and Miller et al. 1990. The quality and type of habitat where crabs settle out of the water column also influences adult crab populations. Armstrong et al. (2003) determined juvenile Dungeness crab density and abundance by age class in several Oregon and Washington estuaries while also considering the influences of water temperature, salinity, sediment composition and habitat. They found the habitat with the highest juvenile crab density was what they called Lower Side Channel habitat, characterized by higher summer temperatures, shallow depths, extensive intertidal areas, and high shell and macroalgae cover. Other habitats called Lower Main Channel habitat and the Upper Estuary habitat were also described and were characterized as follows: Lower Main Channel was defined as being adjacent to the estuary mouth, with cold summer temperatures, high salinity, deep channels, little ground cover, and few intertidal zones; Upper Estuary is indicated by the warmest summer temperatures, low salinities, moderate amounts of intertidal habitat, and high amounts of cover (mainly from shell and woody debris). In the Coos estuary, the Lower Side Channel habitat averaged a juvenile Dungeness crab density of about 1,300 crabs/ha, compared to the Lower Main Channel habitat (600 crabs/ha) and the Upper Estuary habitat (700 crabs/ha)(Figure 6). Although it contains the most productive (and thus most dense) habitat, the Lower Side Channel makes up only 11% of the estuary. Due to its small size this habitat supports the smallest overall Dungeness crab population in the Coos estuary, with a total summer abundance around 300,000 juvenile crabs. The Lower Main Channel represents 64% of the estuary and thus supports the biggest population with a total summer abundance around 850,000 juvenile crabs, while the Upper Bay supports nearly 500,000 juvenile crabs. Estuaries not only provide excellent habitat for juvenile and adult Dungeness crabs, they also may provide refuge from some parasites that may otherwise threaten the health of adult Dungeness crab populations. Oregon Institute of Marine Biology researcher Paul Dunn (2011) examined the effects of the parasitic worm (Carcinonemertes errans) on adult Dungeness crabs. 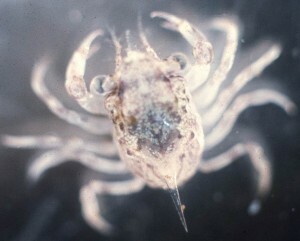 Dunn documented parasitic feeding on the egg masses of female crabs, which caused potentially significant brood loss. Dunn investigated the relative abundance of this parasitic worm in the Dungeness crab population and found that crabs living closest to the mouth of the estuary were infected with greatest number of parasites (Figure 8), and that crabs sampled in nearshore ocean waters had more parasites than crabs sampled from estuarine waters. This difference suggested that the parasite’s salinity tolerances were different than those of their hosts, which means that estuarine waters may act as a refuge for crabs from C. errans parasites. In fact, Dunn reported that Dungeness crabs can tolerate salinities ranging from 11 to 35, preferring salinities over 20 (Cleaver 1949, Robinson & Potts 1979), and determined that only 50-70% of juvenile parasitic worm parasites survived 2 days at a salinity of 10. These results suggest that there may be more to the story because reduced estuarine salinity explained some, but not all parasite loading. Dunn indicated that C. errans larvae prefer to settle on crabs already infected with juvenile worms, providing another piece to the puzzle. ODFW’s Ainsworth and Groth (pers. comm. 2014) report that egg-carrying female Dungeness crab have never been found in estuarine waters (only in the nearshore ocean), which confounds scientists’ ability to conclusively decide whether estuarine waters provide refuge from the parasites for Dungeness crabs. 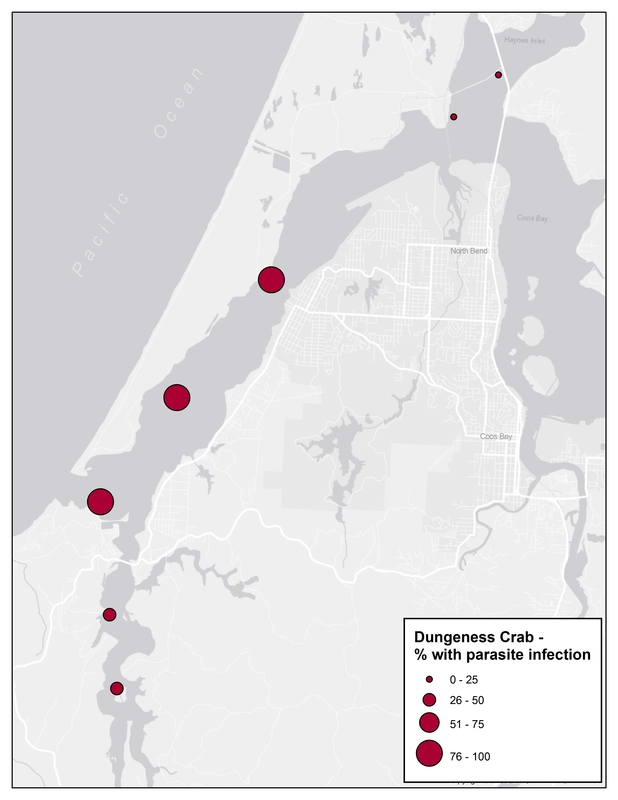 Parasites documented on Dungeness crabs in estuarine waters have been found in relatively low numbers on male crabs (in clusters at the base of their walking legs). They report that the presence of these parasites on the male Dungeness crabs decreases in lower salinity waters in the upper estuary. Ainsworth, J. C., M. Vance, M. V. Hunter, and E. Schindler. 2012. The Oregon recreational dungeness crab fishery, 2007-2011. [Oregon Department of Fish and Wildlife Information Report 2012-04]. Marine Resources Program. Newport, OR. Armstrong, D. A., C. Rooper, and D. Gunderson. 2003. 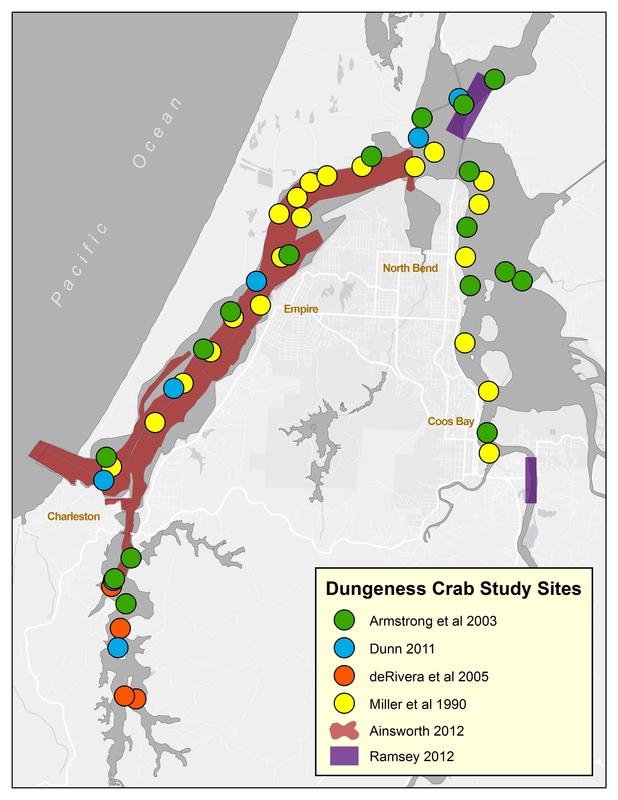 Estuarine Production of Juvenile Dungeness Crab (Cancer magister) and Contribution to the Oregon-Washington Coastal Fishery. Estuaries 26(4): 1174-1188. Cleaver, F. C. 1949. Preliminary results of the coastal crab (Cancer magister) investigation. Biological Report 49A: 47-82.
deRivera, C. E., G. M. Ruiz, J. Crooks, K. Wasson, S. Lonhart, P. Fofonoff, B. Steves, S. Rumrill, M. S. Brancato, S. Pegau, D. Bulthuis, R. K. Preisler, C. Schoch, E. Bolwby, A. DeVogelaere, M. Crawford, S. Gittings, A. Hines, L.
Takata, K. Larson, T. Huber, A. M. Leyman, E. Collinetti, T. Pascot, S. Shull, M. Anderson, and S. Powell. 2005. Broad-scale nonindigenous species monitoring along the West Coast in National Marine Sanctuaries and National Estuarine Research Reserves. [Report to National Fish & Wildlife Foundation]. 126 pp. Dunn, P. H. 2011. Larval biology and estuarine ecology of the nemertean egg predator Carcinonemertes errans on the Dungeness crab, Cancer magister. [PhD Dissertation]. University of Oregon, Department of Biology. Holsman, K. K., P. S. McDonald, and D. A. Armstrong. 2006. Intertidal migration and habitat use by subadult Dungeness crab Cancer magister in a NE Pacific estuary. Marine Ecology Progress Series 308: 183-195. McMillan, R., D. Armstrong, and P. Dinnel. 1995. Comparison of intertidal habitat use and growth rates of two northern Puget Sound cohorts of 0+ age Dungeness crab, Cancer magister. Estuaries and Coasts 18(2): 390-398. Miller, D. R., R. L. Emmett, and S. A. Hinton. 1990. A preliminary survey of benthic invertebrates in the vicinity of the Coos Bay, Oregon, navigation channel. Northwest and Alaska Fisheries Center, Coastal Zone and Estuarine Studies Division. Seattle, WA. Oregon Department of Fish and Wildlife (ODFW). 2001. Oregon marine fisheries 2000 status report. Oregon Department of Fish and Wildlife Marine Resources Program. Newport, OR. Ramsay, J. 2012. Ecosystem services provided by Olympia oyster (Ostrea lurida) habitat and Pacific oyster (Crassostrea gigas) habitat; Dungeness crab (Metacarcinus magister) production in Willapa Bay, WA. [MS Thesis]. Oregon State University. Rasmuson, L. K. 2013. The biology, ecology and fishery of the Dungeness crab, Cancer magister. Advances in Marine Biology 65: 95-148. Ricketts, E. F., J. Calvin, J. W. Hedgpeth, and D. W. Phillips. 1985. Between Pacific tides. Stanford, CA: Stanford University Press. Robinson G. D., and W. T. W. Potts. 1979. Ion fluxes and diffusion potentials in the Dungeness crab, Cancer magister. Journal of Comparative Physiology B 131: 285-292. Shanks A. L. and G. C. Roegner. 2007. Recruitment Limitation In Dungeness Crab Populations Is Driven By Variation In Atmospheric Forcing. Ecology 88(7): 1726–1737.